How to Knit Mitered Squares. In carpentry, corners are usually joined at 45-degree angles. Creative knitters came up with a way to emulate that mitered look in knitting with a deceptively simple pattern of decreases. Not only are mitered squares good for pretty corners, they can stand on their own as a decorative element. The pattern really shines when you incorporate stripes--the angle of the rows stands out much better--so these are a great way to use up bits and pieces of leftover yarn. 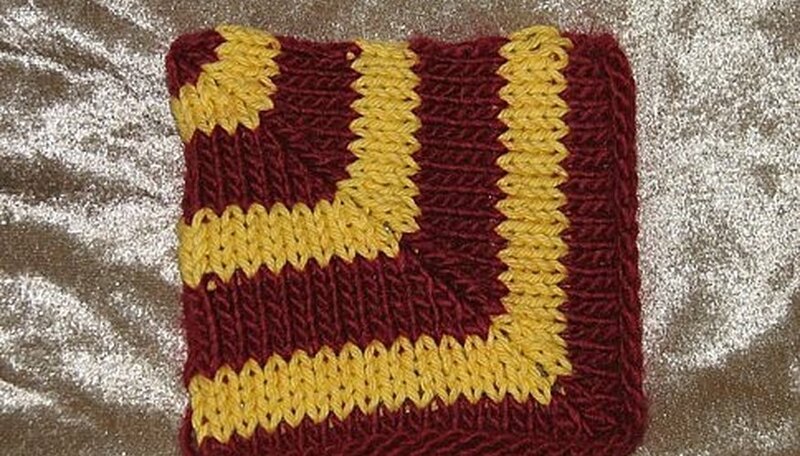 Here is how to knit mitered squares. Knit a gauge swatch in either garter or stockinette stitch, whichever you want your square to be, to determine your stitches per inch. A mitered square can start from any even number of stitches, but if you want a square to fit a certain area, your gauge will be an important factor in how many stitches you cast on. Cast on an even number of stitches using the method you're most comfortable with. This cast-on row represents two sides of your square, not one, so if your gauge is four stitches per inch and you want a 4-inch square, you'll need to cast on 32 stitches, not 16. Work one row, knitting (for garter stitch) or purling (for stockinette) your way across, placing a marker halfway down the row. Using our 32-stitch cast as an example, you would place your marker between stitches 16 and 17. This will be your wrong (or back side) for the square. 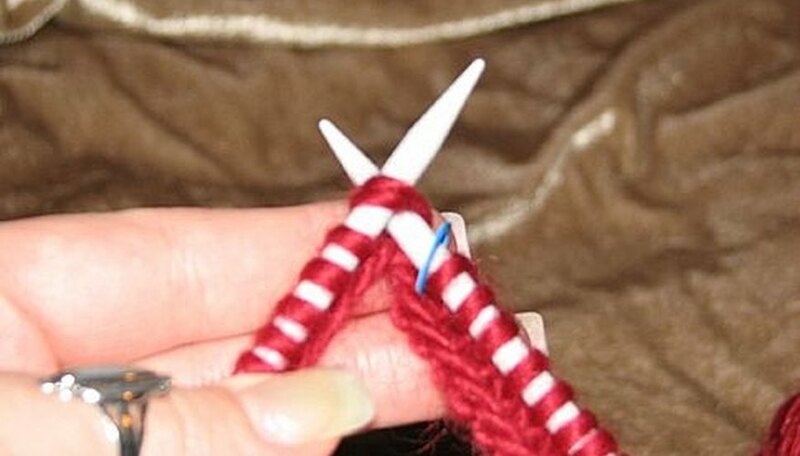 Knit until two stitches before the center marker. Knit two stitches together (k2tog); transfer the marker, k2tog again, then knit the rest of the row. If you prefer the look of the slip-knit-pass to the slipped stitch over (ssk) decrease, you can use that one instead of k2tog, or use one of each per row. Turn the work and knit or purl across the back of the work depending on your pattern. 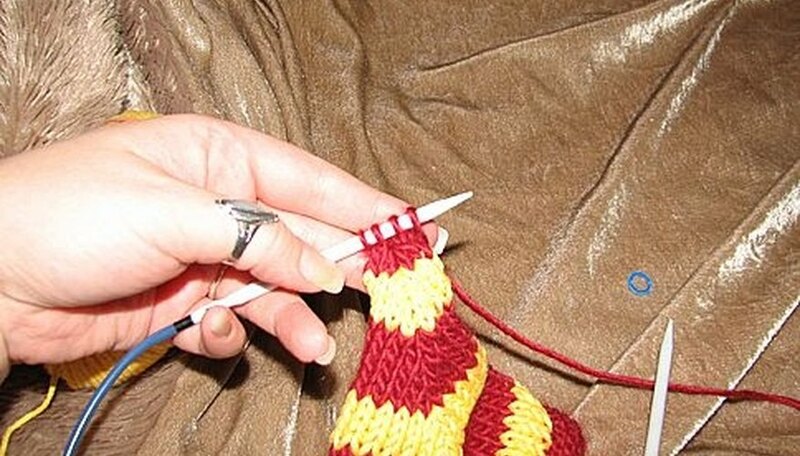 Decrease two stitches on each right side row and work each wrong side row completely until you have four stitches remaining. K2tog twice, work the back row and then knit together the remaining two stitches. Weave in any ends with the tapestry needle and block if necessary. Most mitered square patterns suggest garter stitch, but stockinette does work; you just might have to block your squares afterward to get them fully square. For the best results in striping your square, change colors every four to six rows, always changing yarns on the same side of your work.